Sometimes the vegetables that arrive in my veg box are so stunning that it (almost) seems a shame to eat them. We all know that a romanesco cauliflower is mathematically wonderful and who can say no to a green lemon when it’s yellow inside and full of juice. A bunch of purple spring onions turned up on my doorstep and I knew simplicity would be the way to make the most of them; bold flavours from few ingredients. 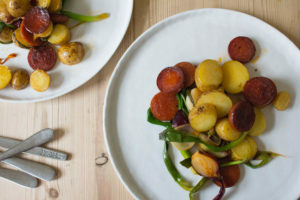 Chorizo Hash with Purple Spring Onions was certainly the way to go. Start by putting the sliced potatoes into a pan of cold, salted water. Bring to the boil and boil for 10-12 minutes or until the potatoes are just cooked. While the potatoes cook put the sliced chorizo into a large frying pan and cook on a low/medium heat so that the fat from the chorizo melts out and fills the frying pan. Drain the potatoes when cooked and put to one side. Halve the spring onions lengthways, removing the dried green ends and any roots, then add to the frying pan with the chorizo. Leave to soften with the chorizo for a few minutes. Add the potatoes to the pan with some salt and pepper and turn the heat up. Fry for another five minutes or so to allow the potatoes and chorizo to crisp up slightly. A handful of ingredients prepared and cooked in less than half an hour; what a plate of pure loveliness. 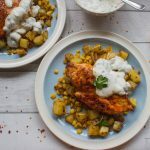 Making the most of an ingredient when it’s available is really important to me and results in meals like this. The potatoes absorb the beautiful colour and flavour from the chorizo oil, the chorizo shrinks slightly and turns crisp on the edges. 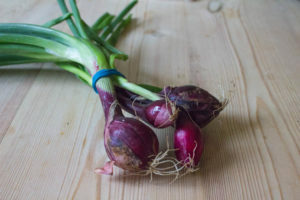 The purple spring onions are silky and drape over everything else quite elegantly, retaining a little bite and some of their raw onion piquancy. Super simple, minimal fuss and absolutely delicious. I have never seen purple spring onions over here…they look really beautiful. The chorizo hash sounds quite tasty. Vegetable boxes are great fun and a fabulous way to get creative! Agreed, some vegetables are almost too beautiful to use 🙂 Great recipe! Oh, wow! 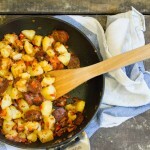 The chorizo is the perfect addition to this potato hash! So flavorful and tasty! Oh wow! Those roasted onions look INSANELY delicious!!!! This dish looks so inviting with all its colors. Perfect. I pretty much love any purple vegetable! We get a lot of purple spring onions here in the Southwest – must be the perfect climate for them. 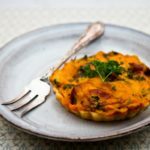 I will make this with my homemade fresh Sonoran chorizo – different from the cured type, but quite good! Green lemon? Purple spring onions. I want to get your veggie box! This is a perfect recipe to showcase them in. I love spring onions but have never had purple ones. I love seeing natural colors in our food and our life in general. This looks like a great dish. 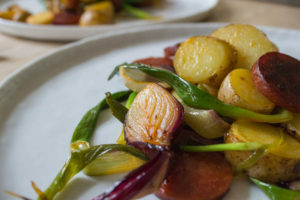 I LOVE purple spring onions and this hash looks absolutely delicious and so full of yum. Lovely share.